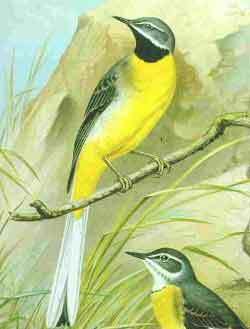 The Grey Wagtail (Motacilla cinerea) is a small member of the wagtail family, Motacillidae. The species looks similar to the Yellow Wagtail but has the yellow on its underside restricted to the throat and vent. Breeding males have a black throat. The species is widely distributed, with several populations breeding in Europe and Asia and migrating to tropical regions in Asia and Africa. They are usually seen on open marshy ground or meadows where they walk solitarily or in pairs along the ground, capturing insects that are disturbed. Like other wagtails, they frequently wag their tail and fly low with undulations and they have a sharp call that is often given in flight. This slim wagtail has a narrow white supercilium and a broken eye ring. The upperparts are grey and the yellow vent contrasting with whitish underparts makes it distinctive. The breeding male has a black throat that is edged by whitish moustachial stripes. They forage singly or in pairs on meadows or on shallow water marshes. They also use rocks in water and will often perch on trees. They have a clear sharp call note and the song consists of trills. The bird is widely distributed across the Palearctic region with several well marked populations. The nominate form (includes caspica of Iran, Turkey and the Caucasus) is from western Europe including the British Isles, Scandinavia and Mediterranean region. Race melanope, which is not well separated from the nominate subspecies, is described as the population breeding in eastern Europe and central Asia mainly along the mountain chains of the Urals, Tien Shan and along the Himalayas. They winter in Africa and Asia. Race robusta breeds along the northeastern parts of Asia in Siberia extending to Korea and Japan. These winter in Southeast Asia. Island forms include patriciae of the Azores, schmitzi of Madeira and canariensis of the Canary Islands. They sometimes occur on the islands to the West of Alaska but have been known to occur further south in California as a vagrant. This species was first described by Marmaduke Tunstall in his 1771 Ornithologia Britannica. The relationships of this species are not well resolved; it belongs to the non-African clade of wagtails, these are confusing in their external morphology, and mtDNA cytochrome b and NADH dehydrogenase subunit 2 sequence data are not able to robustly resolve their relationships. While the present species is probably most closely related to Citrine Wagtails and some Blue-headed Wagtails, the exact nature of this relationship is unclear. The breeding season is April to July and the nest is placed near fast running streams or rivers on an embankment between stones and roots. The male in display, makes short flights up into the air and descends slowly with fluttering flight accompanied by a rapid series of chipping high notes. In Europe the nests are often made in holes in manmade structures. The clutch consists of 3-6 speckled eggs and multiple broods may be raised with declining numbers in the clutch in subsequent broods. The usual clutch size is five in Ireland and the breeding success is about 80% with predation of eggs or chicks being the main cause of breeding failure. The Canary Islands population typically have smaller clutches and the breeding season is not as short and well marked as in populations at higher latitudes. The incubation period is about two weeks with chicks fledging within a fortnight. They live for a maximum of 8 years in the wild. In some parts of the its range the White-throated Dipper nests in the same habitats as the Grey Wagtail and there are some records of interspecific feeding of dipper chicks by nesting wagtails. These birds feed on a variety of aquatic invertebrates including adult flies, mayflies, beetles, crustacea and molluscs. They often forage along roadsides in winter, flushing with a sharp chi-cheep call and flying up further along the road but after some distance turning back to return to the original location. In winter, they roost in small groups. Wintering birds have been known to return to the same sites, sometimes a small urban garden, each year. Adults often have parasitic ticks, Ixodes ricinus, which can harbour Borrelia and thus can potentially disperse Lyme disease over a wide region. Coccidia such as Isospora sp. are known in this species. The Common Cuckoo is sometimes a brood parasite of this species. and Kestrels may sometimes prey on them. ^ BirdLife International (2008). Motacilla cinerea. In: IUCN 2008. IUCN Red List of Threatened Species. Downloaded on 28 Oct 2009. ^ a b Rasmussen PC & JC Anderton (2005). Birds of South Asia: The Ripley Guide. Volume 2. Smithsonian Institution & Lynx Edicions. p. 317. ^ Hume, AO (1890). The nests and eggs of Indian Birds. Volume 2.. R H Porter, London. p. 207. ^ "Checklist of Alaska birds. 15th Edition". University of Alaska, Fairbanks. 2009. ^ Tunstall, Marmaduke (1771) (in Latin). Ornithologia Britannica: seu Avium omnium Britannicarum tam terrestrium, quam aquaticarum catalogus, sermone Latino, Anglico et Gallico redditus.. London, J. Dixwell. ^ Voelker, Gary (2002). "Systematics and historical biogeography of wagtails: Dispersal versus vicariance revisited". Condor 104 (4): 725–739. doi:10.1650/0010-5422(2002)104[0725:SAHBOW]2.0.CO;2. ^ a b c Ali, S & S D Ripley (1998). Handbook of the birds of India and Pakistan. Volume 9 (2 ed.). pp. 290–292. ^ Klemp S. (2000). "Effects of parental effort on second brood, moult and survival in the Grey Wagtail Motacilla cinerea". Ardea 88 (1): 91–98. ^ P. Smiddy J. O'Halloran (1998). "Breeding biology of the Grey Wagtail Motacilla cinerea in southwest Ireland". Bird Study 45 (3): 331–336. doi:10.1080/00063659809461104. ^ Rodríguez B., Rodríguez A. (2007). "Breeding biology of Grey Wagtail Motacilla cinerea canariensis on Tenerife, Canary Islands". Acta Ornithol. 42: 195–199. ^ Robinson, R.A. (2005). "BirdFacts: profiles of birds occurring in Britain & Ireland". BTO Research. ^ Jørgensen OH (1976). "Migration and Aspects of Population Dynamics in the Grey Wagtail Motacilla cinerea". Ornis Scandinavica 7 (1): 13–20. doi:10.2307/3676170. ^ Yoerg, SI & J O'Halloran (1991). "Dipper Nestlings Fed by a Gray Wagtail". Auk 108 (2): 427–429. ^ Santamarina, Jesus (1989). "The Grey Wagtall (Motacilla cinerea) diet in the Ulla river basin, Galicia. NW Spain" (in Spanish). Ardeola 37 (1): 97–101. ^ Neelakantan,KK (1964). "Roosting of the Grey Wagtail [Motacilla caspica (Gmelin)] in the Thekkady Wild Life Sanctuary". J. Bombay Nat. Hist. Soc. 61 (3): 691–692. ^ Nickell, Walter P (1968). "Return of Northern Migrants to Tropical Winter Quarters and Banded Birds Recovered in the United States". Bird-Banding 39 (2): 107–116. ^ Dubska, Lenka;Ivan Literak;Elena Kocianova;Veronika Taragelova;Oldrich Sychra (2009). "Differential Role of Passerine Birds in Distribution of Borrelia Spirochetes, Based on Data from Ticks Collected from Birds during the Postbreeding Migration Period in Central Europe". Applied and Environmental Microbiology 75 (3): 596–602. doi:10.1128/AEM.01674-08. PMC 2632145. PMID 19060160. ^ Svobodova, M (1994). "Isospora, Caryospora and Eimeria (Apicomplexa: Passeriform Birds from Czech Republic". Acta Protozoologica 33: 101–108. ^ Adamík P., Husv ek J. & Cepák J. (2009). "Rapid decline of Common Cuckoo Cuculus canorus parasitism in Red-backed Shrikes Lanius collurio". Ardea 97 (1): 17–22. ^ Costantini, David; Casagrande, Stefania; Di Lieto, Giuseppe; Fanfani, Alberto; Dell'Omo, Giacomo (2005). "Consistent differences in feeding habits between neighbouring breeding kestrels". Behaviour 142 (9-10): 1403–1415. doi:10.1163/156853905774539409.